Self Help Graphics & Art fosters the creation and advancement of new works by Chicano/a and Latinx artists through experimental and innovative printmaking techniques and other visual art forms. Rooted in the Boyle Heights since 1973, it is committed to art and and social justice. Offers artists the opportunity to create fine art limited edition prints and monoprints in an environment that nurtures and supports its artists' creativity and careers. 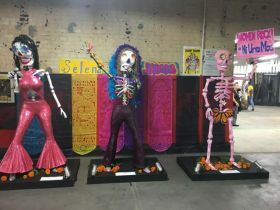 Organizes and produces the most popular Día de los Muertos events in Los Angeles, which may well be the oldest Day of the Dead commemoration in the country. Offers an Artist-in-Residence program that includes project-based, short-term, and long-term residencies in printmaking, curation, research, and documentation. Presents exhibitions, including, for example, Entre Tinta y Lucha: 45 Years of Self Help Graphics & Art and Día de los Muertos: A Cultural Legacy, Past, Present & Future, which was part of the Getty's initiative Pacific Standard Time: LA/LA. Offers a series of workshops designed for artists and artisans to learn the basics of starting and running a business. 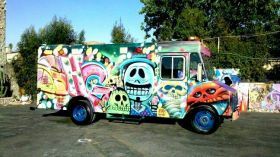 Takes arts programming to the streets via The Barrio Mobile Art Studio. 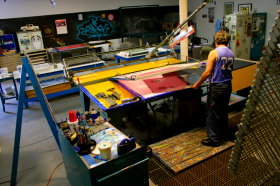 Workshops available in printmaking, digital art, aerosol art, and stencil work.